Does Corporate Team Building Work? Research Says Yes! Terrapin Adventures specializes in creating customized corporate team building programs designed to meet the unique needs of organizations, like yours. Seven researchers from the University of Central Florida and Army Research Institute set out to answer a very simple question – Does Team Building Work? It’s a question many business owners, managers, and decision makers have asked themselves over the years. Does it make sense to invest time and money into Corporate Team Building? Can one day of activities really make a measurable difference? According to research, the answer is a resounding Y-E-S! It’s no wonder that “team building is one of the most commonly applied group development interventions in organizations today,” according to researchers Deborah Diazgranados, Cameron Klein, Eduardo Salas, Huy Le, C. Burke, Rebecca Lyons, and Gerald Goodwin. Does Corporate Team Building Work? Simply put, “Team developmental interventions are key mechanisms that may be used to facilitate team effectiveness,” writes Raymond Noe in Employee Training and Development3. The aforementioned study, simply titled “Does Team Building Work,” looked at the impact of four specific team-building components: goal setting, interpersonal relations, problem solving, and role clarification. Goal Setting: By involving individual team members in goal planning, you further immerse them in the organization. As a result, they become more personally and emotionally invested in the success of the organization, which will cause them to work harder to achieve organizational goals. Problem Solving: As they say, practice makes perfect. By tackling new problems and new ways of problem solving, you encourage your team to start looking outside the box and examining new and exciting ways to approach everyday challenges in the workplace. Role Clarification: Team building helps promote communication and collaboration and thus helps strengthen the chain of command. When your team begins to work together, productivity increases and thus profitability is maximized. Terrapin Adventures, conveniently located between Baltimore and Washington DC, specializes in creating customized corporate team building programs designed to meet the unique needs of organizations, like yours. Our experienced staff is able to design a program – onsite or offsite, indoor or outdoor –to help your group increase their ability to problem solve, think creatively and collaborate with one another. 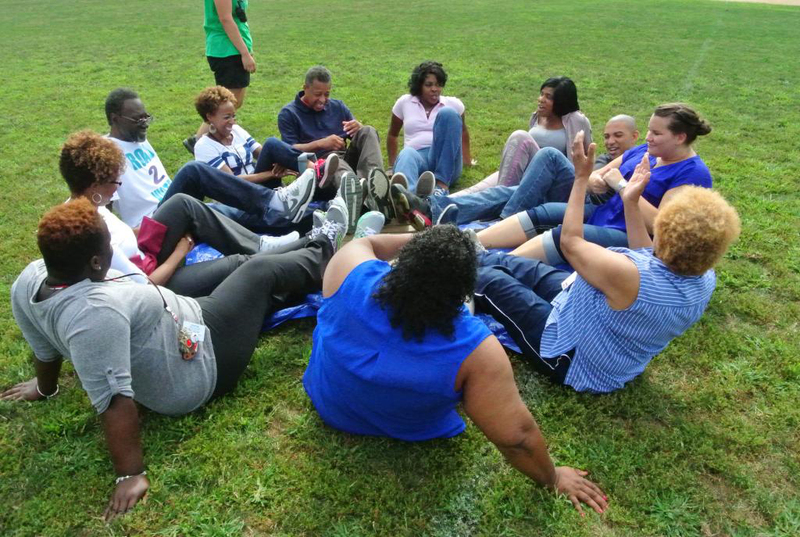 Schedule Corporate Team Building Activities! This entry was posted on Friday, January 8th, 2016 at 9:58 am. Both comments and pings are currently closed. Thank you for your research about this study. You give a great summarize. Those arguments prove my personal experience. But often enough I hear people say, that teambuilding activities are just an expensive waste of time. The points here add some good reasons to this kind of discussion.